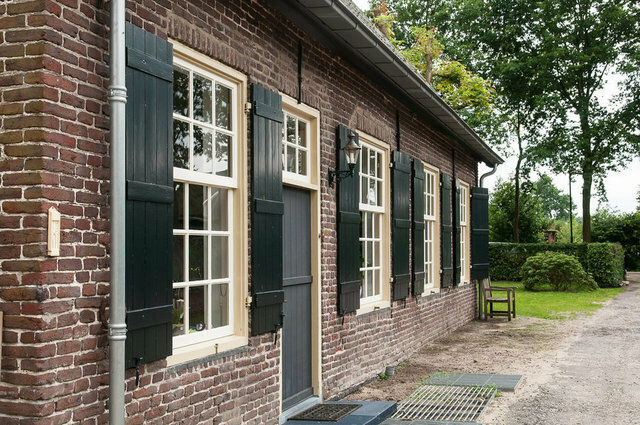 This fantastic property with national heritage status, located just a 25-minute drive from Eindhoven Airport and only 55 minutes from Amsterdam Schiphol Airport, is situated in a delightful location 100 meters from the banks of a narrow river. The river has a small quay, from where you can sail in your own boat to the historic centre of 's-Hertogenbosch, the bustling capital of the province of North Brabant in the south of the Netherlands, with its many lively cafés and restaurants and wonderful shops. This listed building (a 'Rijksmonument' in the Dutch language) named Het Oude Mannengasthuis ('The Old Almshouse for Men') has a rich history. The almshouse was founded in 1492 by Martinus van Elmpt and Ida Roetarts and had space to feed and accommodate six men. In 1803 the original building was demolished and the current house built. Het Oude Mannengasthuis has national heritage status and recently underwent extensive and expert restoration, a process which retained the many original features and details of the building. The entrance to Het Oude Mannengasthuis opens onto a long hallway which stretches almost to the other side of the house, and which provides access to all the rooms on the ground floor. The ground floor has two sitting rooms with either an open fireplace or the basis for an open fireplace, a large kitchen-diner, an office and various other smaller rooms. On the first floor, four bedrooms have been designated, three of which are yet to be fitted out. The first floor also has a luxurious bathroom. Next to the house is a large, new double garage with a second level. The current owner has been granted permission to build an orangery onto the property. Het Oude Mannengasthuis is located on the edge of the village of Esch, near Vught, and is situated in magnificent plot with views across the Escche River and the countryside between Vught and Esch.